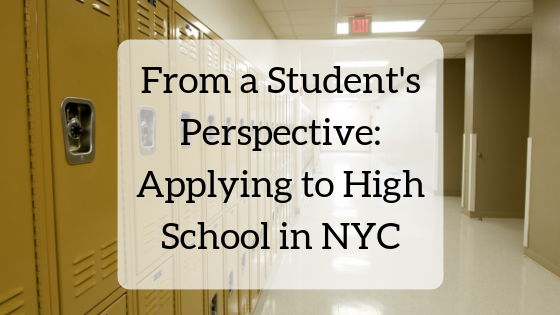 It all started in June of last year when our guidance counselor called a meeting in the auditorium to discuss the high school application process with the 7th graders and their parents. We were handed a massive book with all the high schools in New York City; every school in every borough and every detail you need to know about them. Well maybe not every detail because my family and I did research of our own. But it was a big book with lots of information. We were told by the guidance counselor to read a little bit every day, all through the summer and to start preparing early. Now, while we did research and read up on a lot of schools, we probably didn’t do it as early as she would’ve hoped. To be honest, before August we didn’t really take a thorough look through the ginormous book until we had to. We were still enjoying summer and I was dreading the whole process since I first heard what the previous eighth graders had to say about it. But finally, the day came when my mom told me I had to start looking through the book and mark down some possible schools. So, a couple of days a week, after I came home from camp, I would sit down, book in hand, and skim. That’s around the time that we started meeting with our high school advisor. Along with my parents he was a major part of my high school application process. During our first few meetings he mainly suggested schools to consider based on what I wanted in a school, helped us plan out our time, and many deadlines. In the meantime, I sat down and bookmarked any and all schools that caught my eye. Which meant at first I had a lot to choose from but, as the days passed and I did more research, went on tours, and to open houses we narrowed my list of schools. Then each week we would talk with our advisor and finally by Thanksgiving I had a good list. Before submitting my application in December the list changed dozens of times and for dozens of reasons. If we toured a school and our feelings changed the list would too. If we met the principal or teachers or students the list would change. If I auditioned for a school the list would change. Even if a friend of mine toured a school and gave me their feedback the list would change. And as the application deadline approached I grew ever more anxious about my final decision. We debated every school and its ranking three times over. Finally the time came when we had to hit submit on my application. While I am confident in my decisions and I know I did all that I could, I still worry to this day: did I make the right choice on where to put this school and that school and the other one? The questions swim through my brain like an eager fish trying to escape its bowl. But at this point…it’s up to the DOE gods to decide my fate. I just hope I get into one of my top three schools. Cait Foster is an 8th grader at the Computer School in Manhattan.